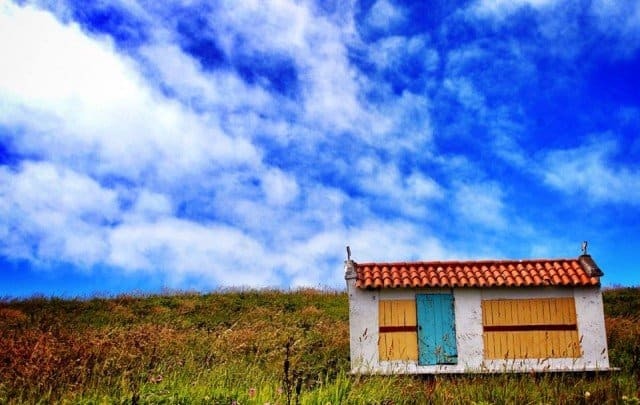 Nestled in the north-west of Spain (between Portugal and the Atlantic Ocean) Galicia has a hint of Spanish flavour but also a distinct location with a lush, verdant landscape that is unmistakably Galician coupled with a rich, diverse cultural history. Natives swap between Galiago and the Spanish language without missing a beat, depending on the nature of the conversation. Though the softer language of Galicia is associated with the countryside and the upper classes refuse to speak it. In Galiago there are over 30 different words for rain and the area does have a more temperate climate and slightly more rain than other areas of Spain, especially the South. Santiago cathedral where St James’ remains are believed to be housed. 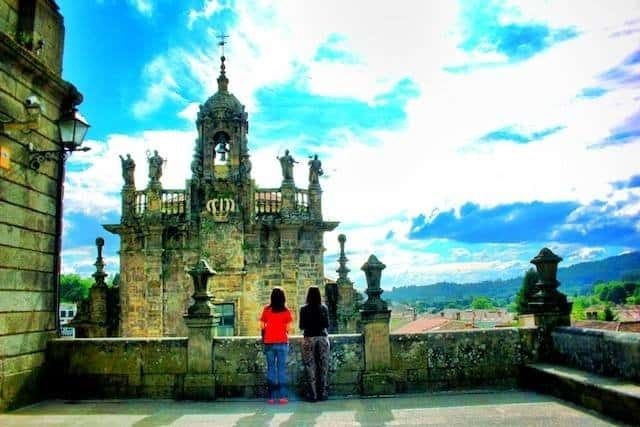 Our guides Ana and Sabela in Plaza del Obradoiro, Santiago de Compostela, looking out at the striking landscape beyond. Upon arrival in Santiago de Compostela, pilgrims would be given a scallop shell as a token to represent the journey that they had completed. They would drink water from the shell. Nowadays, this tradition continues but the streets are also lined with stalls selling scallop shells to tourists. The scallop shell has long been associated with fertility and femininity, and the camino (or pilgrimage) is seen as a symbolic form of rebirth. In Galicia, the shell symbol has come to represent more than the pilgrimage. Large seashells are used as interesting side plates in restaurants and in the town of La Toja, street stalls selling pretty shell jewellery as a popular part of the culture. 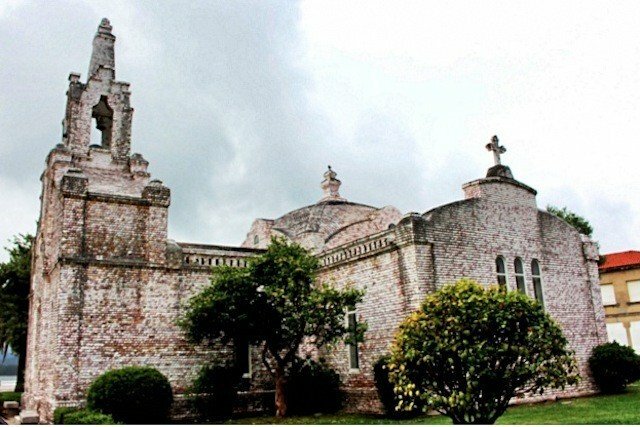 Mariano Rajoy, the president of Spain (who was born in Galicia), got married at La Toja Chapel, a charming building with an exterior covered in pearly cockle shells. 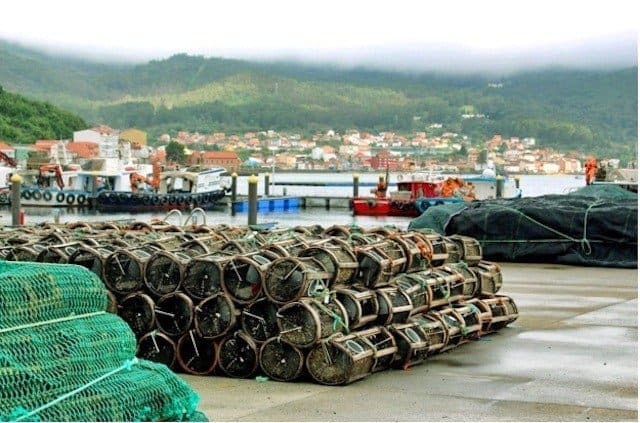 Galicia is celebrated for its seafood (which is the main industry) and the shell has become a symbol of this, as well as the breathtaking coastlines and islands of the area. 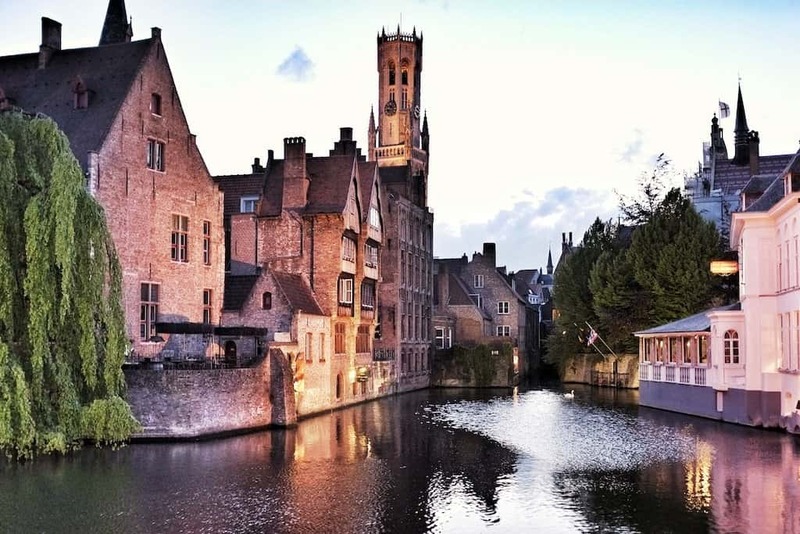 These areas exhibit exceptional natural beauty but are often sadly overshadowed by the grandeur of Santiago de Compostela. Chapel la Toja, covered in seashells. La Toja is also renowned for its mineral soaps and we had a very relaxing thermal spa in the mineral waters at Gran Hotel La Toja. Harbour at Muros. Muros is a traditional fishing town with narrow medieval streets and fishermen’s houses. Home of one of the few tidal mills in Spain (which is no longer in use) and former salting factories. 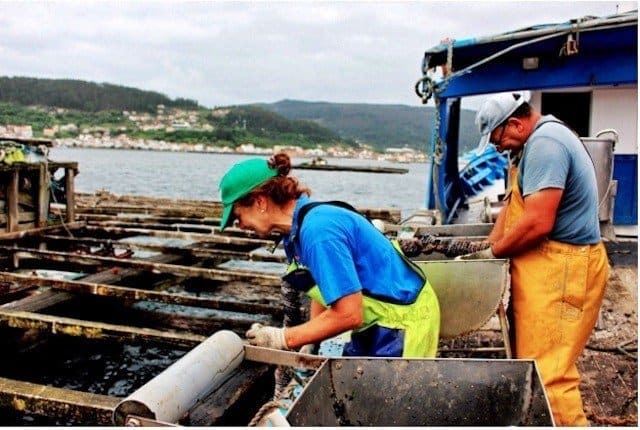 We were fortunate enough to meet the hard-working Lago family who invited us onto their boat, Lourdes del Mar, to get a taste for the mussel industry in Muros. The best way to truly appreciate the beauty of small harbour towns such as Muros, is by taking a boat around the mussel farms and embracing the wild sea air. 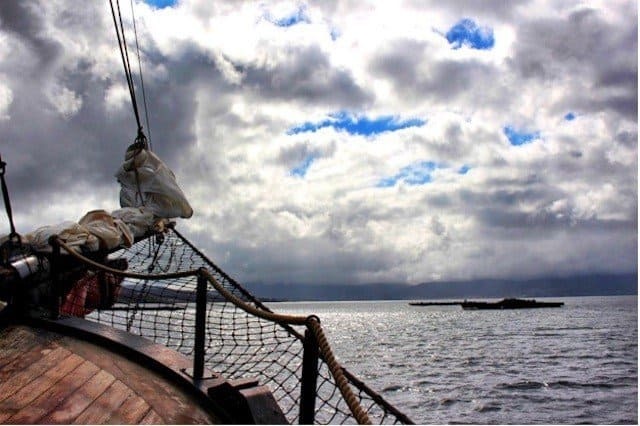 There are plenty of boats for hire, and many have space beneath the deck where they will grill fresh food for you and your party to enjoy during your adventure. 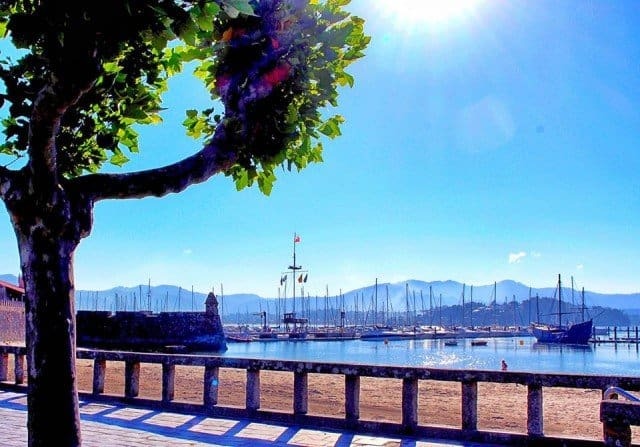 In contrast to the humble, working feel of Muros, Baiona is a pretty and peaceful harbour town. 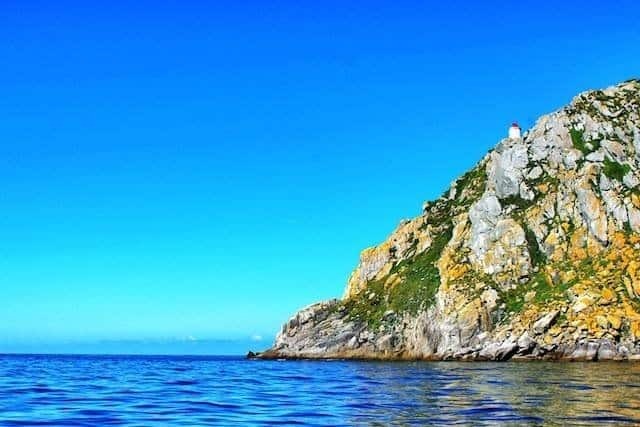 As well as a quiet spot to enjoy the local cuisine, Baiona is also the ideal place to catch a speedboat to The Cíes Islands. The rugged coastline of The Cíes Islands (approached by boat). Due to restricted visitor numbers, this archipelago has a majestic serenity and the natural beauty is perfectly preserved. Views from The Cíes Islands. The area is dense with aromatic eucalyptus trees. These were initially planted by Franco, as their robust nature and speedy growth made them ideal for the paper industry. Unfortunately, they are now draining the soil of the nutrients needed for native trees such as oak trees. While the eucalyptus trees spread like a plague, measures are being put in place to slowly remove them. Despite their vampiric nature, these trees are an identifiable and important part of the current landscape of Galicia. La Playa de Rodas has been listed as one of the most beautiful beaches in the world. 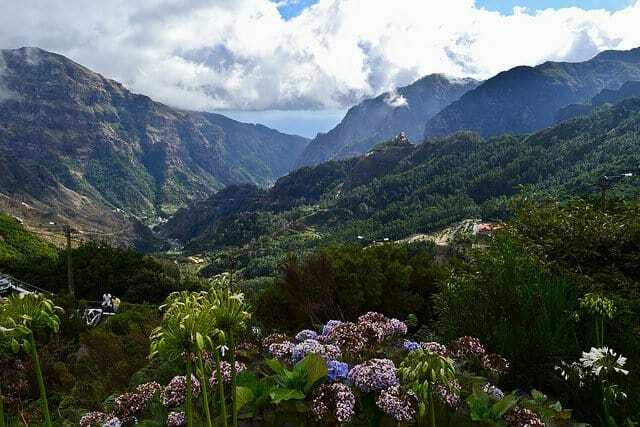 It joins the two of the largest of the Cíes Islands (Faro and Monteagudo). The impressive coastline, lush foliage and secluded island location make this beach a real gem. 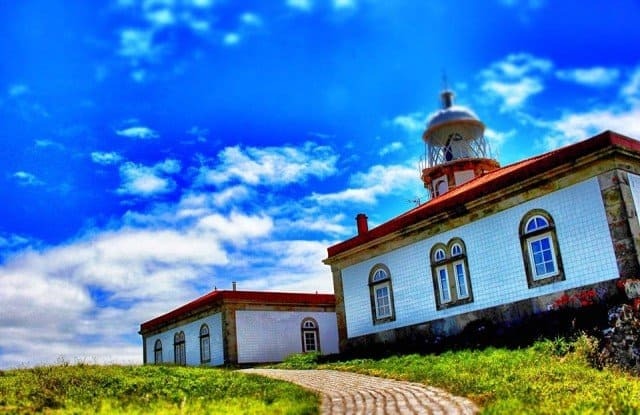 This beautiful lighthouse on the Island of Ons is one of the few to still be maintained by a lighthouse keeper. There are many lighthouses in the area as the coastline is so rugged and fishing is such an important part of the culture. As well as a plethora of lighthouses, the area also boasts an abundance of granaries. The one pictured was amongst many on the Islands of Ons. Although they were initially built for practical purpose (to store, protect and preserve food), they are now an important part of the heritage and a noticeable aspect of the landscape of the area. The food in the area isn’t all seafood, though the locals are immensely proud of this aspect of their cuisine. One of the most unique (and non fish-based) food options are Padrón peppers (pimientos de Padrón). 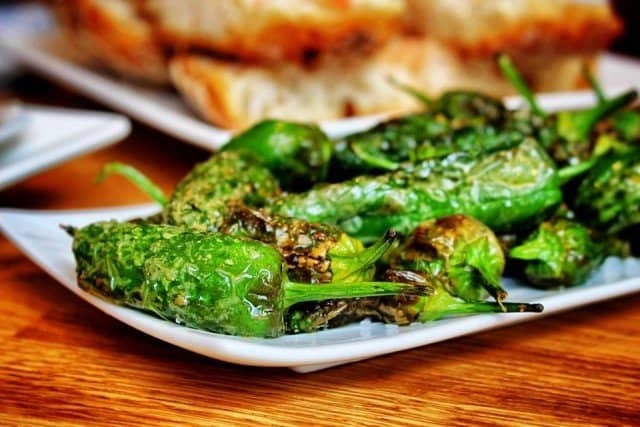 Served charred and drizzled with a liberal helping of olive oil and a hearty sprinkle of coarse rock salt, these green peppers hail from the province of A Coruña. A popular tapas dish evolves into a gastronomic game of Russian roulette as some of the peppers naturally grow to be very hot while the majority have a mild taste. The unpredictability of this simple dish makes it a popular snack amongst friends. 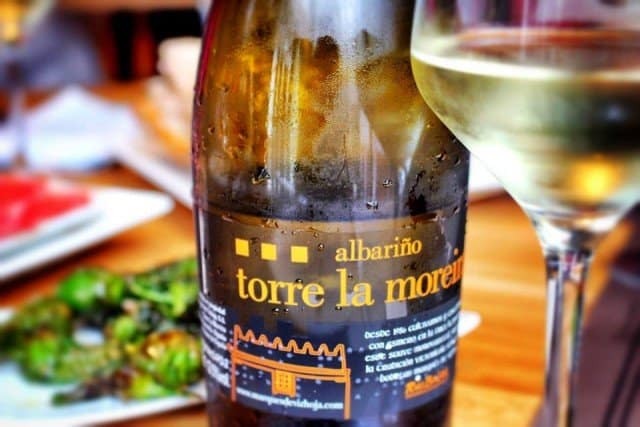 The perfect accompaniment to seafood and tapas, albariño wine is notorious in Galicia. The perfect albariño has the perfect combination of delicate fruitiness and a lean acidity. 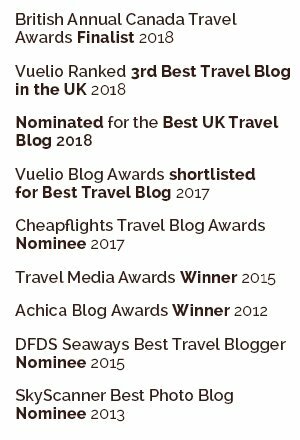 Although Santiago de Compostela is worth exploring and has a fascinating history; the sense of wonder and beauty that you get from the rugged coastlines, traditional fishing towns, wild beaches, charming granaries, iconic lighthouses and the simple yet deliciously fresh cuisine mean that Galicia has so much more to offer than just caminos and religious relics. All words and images by our writer Holly Daffurn. 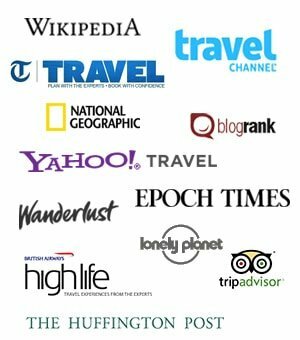 This post was written as part of the #inGalicia blog trip, created and managed by Captivate in partnership with the Spanish tourism board. 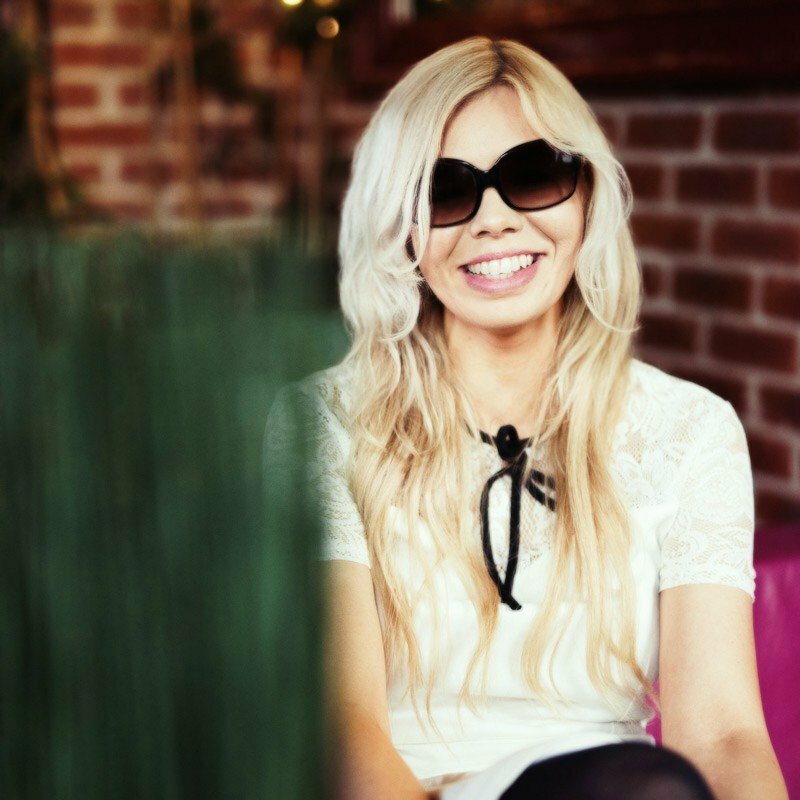 All opinions are Holly’s own. 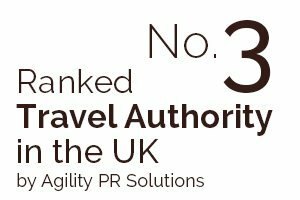 You can fly from London Heathrow to A Coruña with Vueling or from London Gatwick to Santiago de Compostela with Vueling and Easyjet. Thanks, Gary. It’s easy to photograph when it’s such a beautiful place. So different to the rest of Spain. I really recommend a visit if you get chance! Wow would love to visit this region for the wine, the food and the beaches which all fantastic! If you like fine wine, great food and idyllic beaches then you’ll adore it! Beautiful landscapes too. Spectacular looking region, I didn’t know much about it before but it looks like it’s worth a visit especially but it’s avoiding all the crowds! It certainly is worth a visit. Santiago can get a little busy at times but it is bustling rather than overwhelming. The coastal area is so beautiful though, and delightfully deserted. Great photos and the beaches look so peaceful and inviting – unusual for Spain as the beaches are usually so crowded. This looks like a real hidden gem! 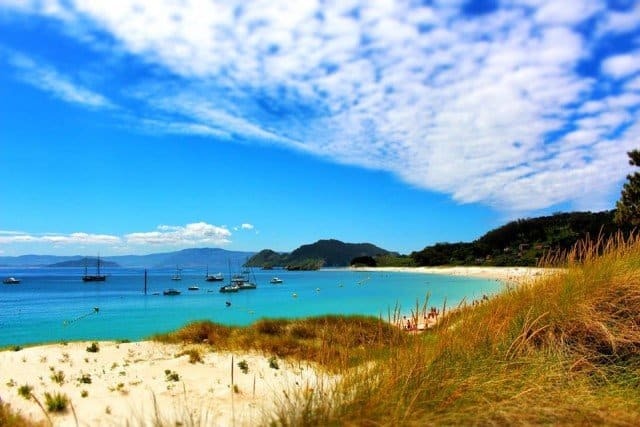 Because they limit the number of daily visitors to the Cíes Islands (and there are several beautiful beaches to choose from) you can guarantee a peaceful beach. Something extra magical about taking a boat to get to a beach too! Great pictures, it’s not an area I know very well so it’s great to read about it! Thanks, Jake. It was a real pleasure to photograph. It seems to slip beneath most people’s radar, but is such an interesting and beautiful place to visit. From the pictures one can guess what amazing the place will be. I’m in love with it too! The perfect mixture of wild, rugged landscapes and serene beaches. Definitely worth a visit if you get chance! Thank you! It has so much to offer. Definitely a hidden gem. I actually didn’t know that Galicia had so much to offer when it comes to tourism. Definitely a place to try some delicious local food! Mniam! Oh, the food was divine! A real focus on locally sourced, seasonal produce. So much to explore too. I’m afraid we didn’t get to experience any of the football! However, we were lucky enough to try several different pulpo a feira dishes. It was beautiful! I posted a picture to our twitter page. The food in the area is exceptional. Galicia looks amazing. Even though I follow Spanish La liga every week, via which I know the names of almost every major city in Spain, I have never heard about Galicia. Well one thing is sure, that if I am ever planning to visit Madrid for El Clasico (Madrid vs Barcelona), Galicia will be in my list of places to see in Spain. It would definitely be worth doing. 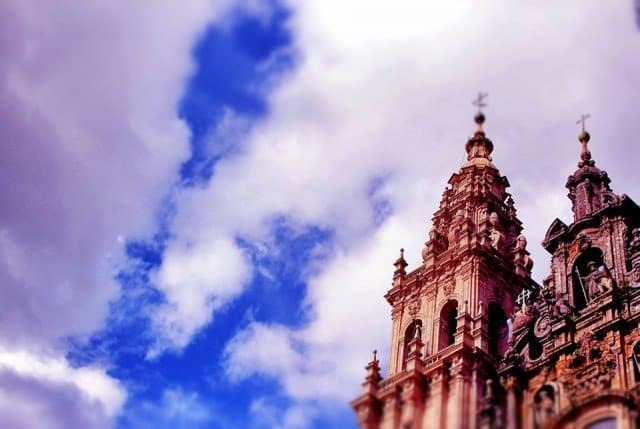 You can fly in to Santiago de Compostela from Madrid. Galicia is such a contrast from Madrid, it would be a truly memorable trip. I saw Real Madrid vs Barca at Camp Nou a few years back and it was so exhilarating. I hope you get to experience it! So colourful- the pictures and descriptions. Those peppers seem to jump off the plate! I’m hoping the padrón pepper seeds that I bought from Muros will turn into plants that are just as colourful and tasty. Have a feeling that they need that magical Galician sunshine though! How gorgeous is Play de Roads?! I can see why it’s got a great reputation as far as pretty beaches go. Also love the sound of visiting the mussels farms, especially given that you got a chance to get an insight into it from the locals. It was such an honour to get to meet the Lago family and to get a taste for life working on the mussel farms. It was one of the highlights of the trip for me. La Playa de Rodas was stunning! There is something magical about a secluded island beach. 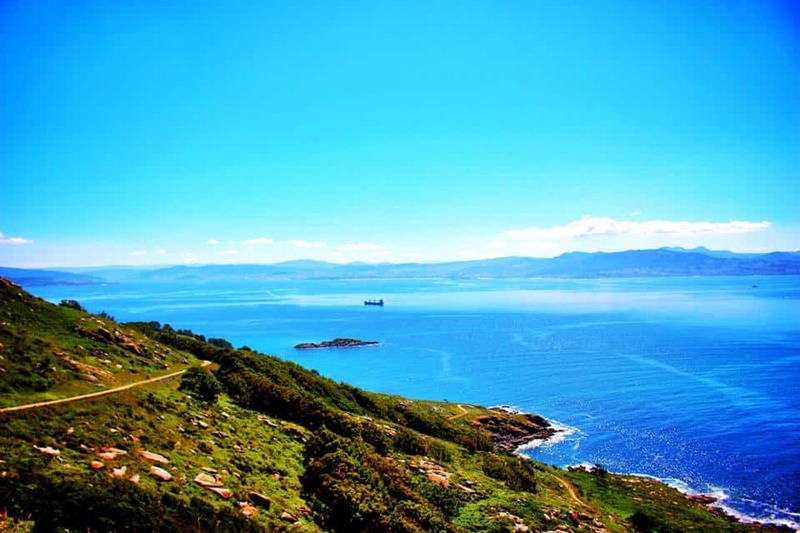 Holly, those are some beautiful pictures and Galicia sure looks like a great place for hike. I love those rugged places where you enjoy the nature the fullest. Thanks, Marc. It really is a place of great natural beauty, ideal for hiking. It was so beautiful but peaceful too, it felt like we had the islands all to ourselves. It was so pretty! I’ve never seen anything like it before. I’d definitely recommend a visit to Galicia if you ever get the chance. That beach looks spectacular – just like something you might come across in the Whitsundays Australia as opposed to the northwest coast of Spain! I agree! I adore Spain, but Galicia is something else! A real hidden gem.